Fig. 326 Clouded drab moth, Orthosia incerta (x3). greatest significance as pests of tomato and other glasshouse crops, especially those growing in structures with artificial lighting. The young larvae graze on the underside of leaves but leave the upper epidermis intact. Older larvae bite right through the leaves and, when numerous, can cause significant defoliation. Larvae also attack buds and flower trusses. 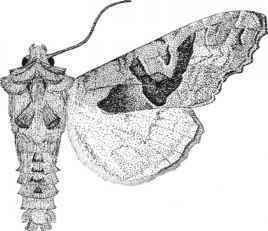 Moths occur throughout much of the year but are particularly numerous in May and June and in the autumn. 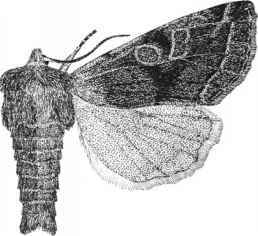 When at rest, the wings are folded longitudinally and the moth resembles a withered leaf. Eggs are laid singly or in small batches on the leaves of host plants. They hatch within about 10 days, but usually more rapidly under glass. Larvae may be found feeding throughout the year, but are usually present as two indistinct broods from autumn to spring and in the summer. Fully fed larvae pupate in the soil, each in a flimsy cocoon. Fig. 327 Angle-shades moth, Phlogophora meticulosa (x2.5). in diameter, hemispherical and strongly ribbed; pale yellow, with darker markings. Larva up to 40 mm long; body plump, yellowish-green or brownish, with a thin, broken line, and feint V-shaped or W-shaped marks along the back; spiracles white and black-rimmed.